A collection of short stories featuring Iris Wildthyme. Edited by Paul Magrs and Stuart Douglas. Stories by Steve Lyons, Mags L. Halliday, Mark Wright and Cavan Scott, Stuart Douglas, Philip Purser-Hallard, Paul Magrs, Steven Wickham, Cody Schell, Jonathan Dennis, Stewart Sheargold and Steven Cole. Published in May 2009 by Obverse Books. What is there left to say about Iris Wildthyme – transtemporal adventuress extraordinaire, metafictional explorer of texts and subtexts, double-decker-dwelling interstellar bag-lady, amnesia-prone political and sexual revolutionary, writer of wrongs, wronger of rights (especially copyrights), all-round champion of freedom, occasional nightclub singer and frequent bar-room floozy? A collection of brand new stories, taking the transtemporal adventuress and her trusty companion Panda all the way from snowy Darlington to the literal end of the universe (and beyond), visiting friends old and new on the way. With an introduction by Iris’s alter-ego, Katy Manning, original artwork by legendary Doctor Who artist June Hudson and new stories from Paul Magrs, Philip Purser-Hallard and Steve Cole amongst many others. There really is always something new in the headlights of Iris’s trusty number 22 bus to Putney Common! Click me to see promotional artwork! Iris remembers her times aboard the Battleship Anathema as glorious, colourful fun: gay and cheerful adventures fighting villanous cybernetic dinosaurs with her space-pilot friends Uriel, Nero and Mule, and not forgetting their cute little robot Chukka. Together they explored garishly-coloured planets, rescued scantily-dressed princesses and made astonshingly inept fashion choices. So why, when Iris takes her new friend Panda to visit the Anathema thirty years later, is everybody acting so grim all of a sudden? Whence all the gloom, drabness and po-faced military machismo? And why does her old friend Uriel – aka Admiral Rex Halidom of the Cardinal Flotilla – think he’s entitled to use her bus in a potentially genocidal military manoevre against their old foes the Cyrenes? Buy Iris Wildthyme and the Celestial Omnibus from Obverse books as a hardback or ebook. Buy the Kindle edition of Iris Wildthyme and the Celestial Omnibus at Peculiar Tomes, Amazon.co.uk or Amazon.com. View Cody Schell’s promotional artwork for ‘Battleship Anathema’. 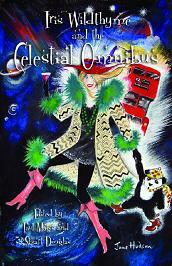 Read online reviews of Iris Wildthyme and the Celestial Omnibus . All material © Philip Purser-Hallard 2009 except where otherwise noted, and not to be used without permission. Pandroid icon © Cody Schell 2009. Iris Wildthyme and the Celestial Omnibus cover by June Hudson, cover design by Mark Michalowski and Iris Wildthyme logo by Anthony Dry © Obverse Books 2009.